April has, somewhere along the way, been dubbed National Grilled Cheese Month in the United States. And, like melted cheese oozing out around the edges of a grilled cheese sammy, the idea seems to be slipping across the Canada-U.S. border. And why not? While it isn’t officially grilled cheese month in Canada, there’s no reason we can’t help our friends to the south pay tribute to this sovereign of sandwiches. So, get out your favourite curd, use your imagination and create yourself a "toastie with the mostie". And as you nibble away, here are some delectable crumbs of knowledge to help feed the dinner conversation. The Croque Monsieur (a grilled sandwich made with ham and gruyere cheese) first appeared on the menus of Paris cafes around 1910. According to the website foodtimeline.org, the grilled cheese sandwich gained popularity during the 1920s when the availability of inexpensive sliced bread and processed cheese made it an affordable mealtime option. During the Great Depression of the 1930s, an open-faced version of the grilled cheese sandwich (knick-named the “cheese dream”) became regular fare at the Sunday dinner table. In the post-war years, the cheese dream continued to enjoy popularity – served up alongside tomato soup to create a simple, nutritionally balanced meal. Kraft Singles where introduced in 1949. Today, there are entire cookbooks devoted to the art of making gourmet grilled cheese sandwiches. Ready-made versions of the grilled cheese sandwich can now be found in the frozen food section of your local grocery store (although why you would want to buy one is beyond us). 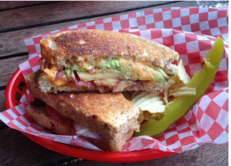 A number of restaurants that focus on gourmet grilled cheese sandwiches are springing up (The Grilled Cheese and Cheesewerks are two in Toronto). In short, the grilled cheese sandwich has become an ingrained part of the North American culture and cuisine – on both side of the border. Curd crime - stats are whey up! Some folks will stop at nothing to get their daily cheese fix. A CBC News story from August 2012 reported that Ottawa police were hunting for a man in his mid-20s who tried to pinch 21 blocks of Black Diamond cheese from a local Food Basics. The man was spotted by an in-store security oficer leaving the premises without plunking down cash for his curd. The suspect escaped on a bicycle, but abandoned his bag of cheese in the ensuing chase. But wait...there's more. In September 2012, Niagara Regional Police arrested and charged three men -- one of them a police office -- in regards to a large-scale smuggling operation. According to police, cases of cheese were bought in the U.S., smuggled across the border without paying duty, and then sold to restaurants in Southern Ontario. As it turns out, a life of curd crime isn’t that uncommon. In fact, according to the Centre for Retail Research, cheese is the most pilfered food in the world. Consultants suggest that cheese tops the list of shoplifted food items because it’s widely enjoyed, easy to conceal and kept in fridges rather than on shelves that are subject to more extensive surveillance. Fresh meat and candy rank two and three, respectively, on the “grab and go” list. There’s something comforting in the fact that shoplifters seem to have good taste. If you ask a Brit, they’ll tell you their cheddar is better. In fact, they’ll tell you that Canadian cheddar isn’t even real cheddar at all. Pshaw! If that’s true, Brits have a funny way of showing their distaste for Canadian cheddar. At the turn of the 20th century, they gobbled up literally tons of the stuff. In fact, in 1903 – Canada’s biggest year for cheese exports – we exported 114 million tons of cheese. Virtually all of it was cheddar and most of it sailed across the pond to Britain. Unfortunately, some less than scrupulous cheese factories began shipping “green cheese” – cheese that hadn’t had a chance to age properly. Some was being shipped within two to three days of being made. The result, according to a letter drafted by a group of British importers, was a cheese that was “insipid in flavour and in a condition which reflects anything but credit upon the product.” Maybe we were just keeping the good stuff for ourselves. James Lewis (J.L.) Kraft, the founder of Kraft Foods Inc. was born on a dairy farm near Stevensville, Ontario back in 1874. Early in his career, he worked at Ferguson's general store in nearby Fort Erie, Ontario. He later immigrated to Buffalo and then to Chicago. It was in Chicago, in 1903, that he started his own business selling cheese wholesale from a horse-drawn wagon. He opened his first cheese manufacturing plant in 1914 and patented the method for making process cheese in 1916. The company expanded quickly during World War I when the company provided tinned cheese to the U.S. armed forces. The company established operations in Canada in 1919. We love our cheese! Canadians love their cheese, but maybe not as much as the Greeks, French and even the folks from Iceland. According to figures published by the Canadian Dairy Information Centre, the average Canadian consumed 12.3 kg of cheese in 2009. That`s a fair chunk of cheese. By comparison, however, the Greeks consumed 31.1 kg of cheese per person, the French consumed 26.1 kg, and the people of Iceland 25.4 kg. Then again, it’s not about quantity, it’s about quality. Sure, we eat less cheese. But maybe the cheese we eat is better. If variety is the spice of life, nobody can call Canadian cheesemakers bland. At least not according to numbers published by the Canadian Dairy Information Centre (www.dairyinfo.gc.ca). Based on figures published by the centre, Canada produces 1,050 different cheeses, including 667 distinct varieties of cheese – many of which have received international recognition for quality and taste. More than two-thirds of the 667 varieties are made in Quebec. In case you were wondering, the differnt varieties are determined based on guidelines that take into account the type of milk, the style of cheese, how the milk has been treated, the fat content, how long the cheese has been aged, and the production method. So what is poutine? Nothing less than a mound of golden French fries (fried potatoes) covered with a generous layer of fresh cheese curds and smothered with steaming hot brown gravy. As you might guess, the hot gravy melts the curds resulting in a gorgeously gooey gastronomical delight. Poutine may not look that appetizing, but the taste is divine. Millions of Canadian can attest to poutine’s perfection. According to Wikipedia this cheesy wonder originated in rural Quebec during the 1950s. Today, it’s sold across the Great White North – everywhere from the local greasy spoon to McDonalds. You’ve probably heard of stock futures, oil futures and even wheat futures. Cheese futures began trading on the Chicago Mercantile Exchange in June 2010.
country’s $6 billion cheddar cheese market.